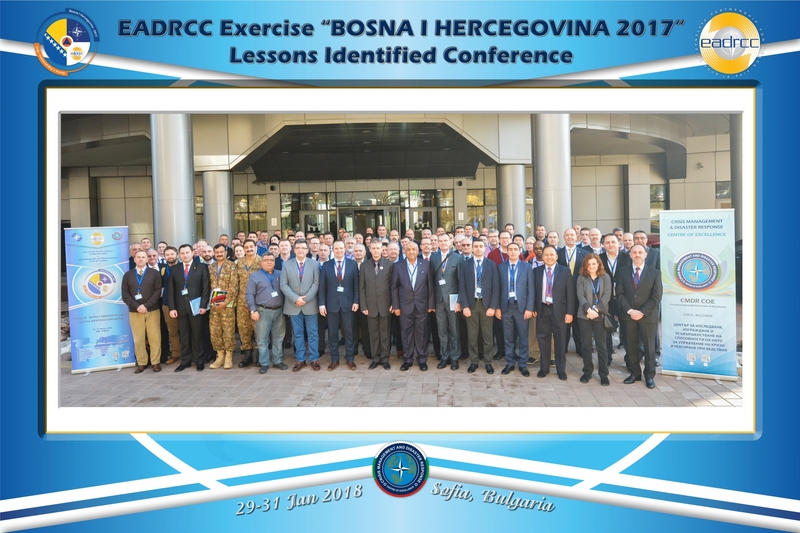 The Lessons Identified Conference for the consequence management field exercise “BOSNA I HERCEGOVINA 2017” was officially launched today by Mr. Claudiu Zoicas, team leader at the Euro-Atlantic Disaster Response Coordination Centre (EADRCC) Civil Preparedness Section, by Mr. Samir Huseinbasic, exercise director on behalf of the Ministry of Security of Bosnia and Herzegovina, and by Col Vasileios Palaiologos, CMDR COE Deputy Director. The three keynote speakers all highlighted the importance of the 2017 exercise in terms of improving international cooperation and interoperability in disaster response activities. As a follow-up on the exercise, the jointly organised by the CMDR COE and the EADRCC Lessons Identified Conference, taking place on 29 – 31 JAN 2018 in Metropolitan Hotel, Sofia, will provide participants with an ample opportunity for exploring the added value of an integrated approach to lessons identified and of modern technologies in coordinating and providing disaster response. This stock-taking event has gathered more than 100 representatives from NATO Allied nations and Partner nations across NATO partner frameworks, including: Partnership for Peace (PfP); Mediterranean Dialogue; Partners Across the Globe, as well as from the Republic of Iraq. Representatives from NATO, the UN, and the OSCE as well as from GOs, NGOs and academic institutions add to the diversity and multidimensionality of the event.